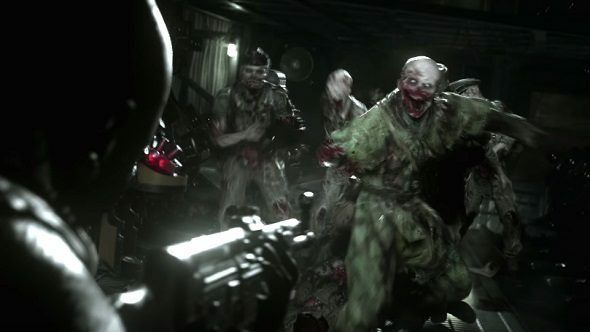 Sledgehammer are going all out on the horror for COD: WW2’s Nazi Zombies mode, which looks grimy, gross, gory, and glorious. All of the Gs and the Zeds, basically. Check our list of the best zombie games for more shamblers. The map shown in the trailer looks like a top secret Nazi research bunker, in which they’re creating soldiers from the dead that litter the battlefields. Of course, a crazed doctor is behind it all. He seems quite proud of his work, and boasts that he’s even created one better than the perfect soldier: the devil himself. It’s probably a safe bet that he’s talking about the lumbering, probably unkillable Nemesis-style creature towards the end of the trailer. It’s carrying a massive sword. COD: WW2 releases on November 3. You can watch the new trailer above.